“Tummy still aches from laughing! Best nite out!” L.A.
“I haven't laughed that hard in a lonnnng time.” T.C. “You were amazing! Loved every minute of it!” A.K. "Have not laughed this much. Ever." C.B. "One of the best nights ever! You'll laugh until you cry!" R.L. "So much laughing and smiling that my face still hurts...loved,loved,loved it!" K.S. “Would go again in a heart beat! !” V.J. “A perfect night of fun and laughs!” K.T. “Loved, loved, loved your show tonight!” N.S. 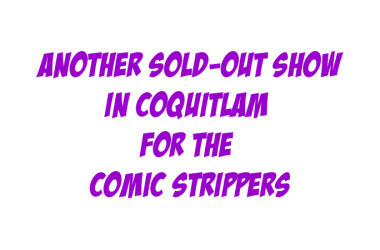 “If there is ONE event this year you should go to, it's definitely The Comic Strippers!!!!!!! !” H.B. Come and see the explosion of ridiculousness that was a smash hit at the Adelaide Fringe in Australia and has recently been selling out theaters all over Canada and the US. Click for a list of all UPCOMING SHOWS!! See them LIVE! Almost too hot for TV…. But not quite.Behold The Comic Strippers'videos and pics! CHECK OUT OUR PROMOTION PICS HERE and our INSTAGRAM PAGE HERE! "★★★★★ Extremely funny comedy show that showcases mercurial improvisational talents"
Just what are people saying!? Want to see the Chips LIVE near you? Drop us a line!